Joydrive delivers new and pre-owned vehicles to customers; bringing the dealership to your driveway. "Buying new cars is a nearly $600 billion industry in the U.S., yet, until Joydrive, there was not a complete digital marketplace solution for customers, many of whom don’t like visiting dealers." 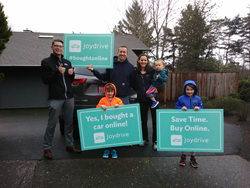 Joydrive will mark the launch of the first online marketplace for new and pre-owned cars with a commercial to be aired in the Seattle-Tacoma market twice during Super Bowl 52 on Sunday, February 4. The thirty second spot -- which you can view here -- describes with simple, colorful graphics the breakthrough mobile-friendly platform that empowers customers to complete their entire car buying process online, including trade-in, financing and home delivery in as fast as one day. No visit to a dealership is necessary. Customers enjoy a five day return period to drive and experience the car in the way they’ll actually use it. “The Super Bowl is a major event, and Joydrive’s presence during the broadcast reflects what a major breakthrough our platform is for customers,” said founder Hunter Gorham. Joydrive, which is based in Seattle and North Carolina’s Research Triangle region, spent the previous two years in beta mode, stress-testing the platform and delivering over 250 transactions to customers from California to Montana. Joydrive has recently increased its available inventory from 500 to over 3,000 and expects to be over 15,000 within the next six months, making it the country’s largest online marketplace. Joydrive chose the Seattle-Tacoma market for its Super Bowl debut because of the platform’s strong network of auto dealerships in the area, which includes a population of about 5.2 million people. This dealer network is key to Joydrive’s unique value proposition and positive customer experience. Expansion plans include both surrounding states and regional targets such as Texas, Florida and the Carolinas. Joydrive is significantly different from other online car buying platforms in part because of its network of handpicked dealers. Through this network, Joydrive creates an easy, transparent and consistent car buying experience across all brands and vehicles. By purchasing vehicles from dealers through Joydrive, customers get more selection, a faster and easier process, and can trust their vehicle will be handled by licensed professionals. Indeed, the customer experience can be dizzying. Auto manufacturers depend on a network of licensed dealers to sell new cars. In this highly fragmented industry, there are over 18,000 individual rooftops licensed to sell new cars, and no single dealership group has more than three percent market share. Furthermore, the average time a customer spends at a dealership is three hours, with many customers spending as many as six in a dealership to complete their purchase. The situation, as Joydrive’s leaders duly noted, is ripe for sweeping improvement. Gorham became acutely aware of these challenges during his 14 years at Ally Financial, most recently helping lead Ally’s National Digital Auto business. Leveraging his relationships with some of the top-rated dealers in the country, Gorham left Ally to build an easier, digital-first solution for customers. Joydrive is a digital marketplace that facilitates transactions between customers and a highly select network of dealers. By providing customers access to a marketplace, Joydrive can offer a wide selection of brands, vehicles, purchasing and financing options and ensure the experience is consistent and transparent across all dealers. Additionally, by embracing the dealer, Joydrive can offer many customers delivery in as fast as one day and follow-up service as needed. Buy Online: The entire process can be completed online, from vehicle selection to delivery. After securing a vehicle with a $500 fully refundable deposit, a user-friendly dashboard shows all details of the transaction including trade-in, Vehicle Service Contracts, financing options and delivery scheduling. Of Joydrive’s 250+ transactions in beta mode, 40% included a trade-in and 60% included financing. Home Delivery: Communicating through the dashboard, customers coordinate the vehicle delivery date and time with their licensed dealer representatives. Joydrive has delivered vehicles from California to Montana with an average distance of 135 miles. Because vehicles are located on dealer lots, delivery can occur as fast as one day. 5-Day Return Period: Buying a car can be the largest transaction customers make, so Joydrive and their dealer members offer a 5-day return period or up to 250 miles to ensure customers love their purchase. Customers can drive the car how they will actually use it. To date, less than 3% of Joydrive’s transactions have been returned. Joydrive handpicks only a select group of dealers for the platform, and Joydrive’s current dealers are some of the top-rated dealers in the Pacific Northwest. Names like Harnish Auto Family and Titus-Will are well-known in the Greater Pacific Northwest area as providing some of the best customer service in the industry. Joydrive has 24 signed dealerships across brands including Toyota, Subaru, Chevrolet, Ford, Nissan, Cadillac, GMC, Volkswagen, Hyundai, Kia and more. Additionally, Joydrive has signed Northwest Motorsport, one of the largest pre-owned dealers in the country. During the past three months, Joydrive has increased its inventory from 500 listed vehicles to over 3,000. Joydrive is expanding rapidly and adding more qualified dealerships in other regions. Joydrive plans to operate nationwide within 12 months. Joydrive (http://www.joydrive.com) is the first online marketplace where customers can buy both new and pre-owned vehicles without visiting a dealership. Through Joydrive, customers are empowered to complete the entire car buying process online, on their own time and at their own pace. With financing and trade-ins built directly into the mobile-friendly platform, with home delivery in as fast as one day, and with a five-day return period, customers experience a seamless, transparent, and worry-free purchasing transaction. While Joydrive removes the need to visit a dealership, the company works with a select network of industry-leading dealers providing customers more brands, more vehicle choices and faster delivery. Joydrive is initially serving the greater Pacific Northwest region and will be expanding nationwide.